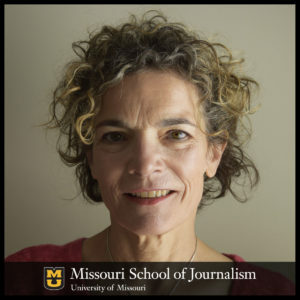 Kathy Kiely has been named the Lee Hills Chair in Free-Press Studies at the Missouri School of Journalism, effective July 1. After a long career covering politics in Washington, Kiely moved into the classroom fulltime because, she says, universities are the laboratories that will discover the formula for making fact-based journalism viable again. A 2017-18 journalism lecturer at the University of New Hampshire, Kiely has also taught at American University, George Washington University and Princeton University. As the inaugural Press Freedom Fellow for the National Press Club‘s nonprofit Journalism Institute, Kiely has organized events around free speech issues and advocated for journalists who have been jailed or threatened for their work, most notably Emilio Gutierrez-Soto, a Press Club award winner currently being detained by U.S. immigration officials. Barbara Cochran, the School’s Curtis B. Hurley Chair in Public Affairs Reporting, heads the Journalism Institute. Kiely’s reporting and editing career includes stints as a Web producer for WAMU-FM, and as an editor for Bill Moyers and for Bloomberg Politics. She is an interdisciplinary team builder: At the Sunlight Foundation, she worked with reporters, designers, developers and policy advocates to press for more access to government data and create web-based tools that made it more user-friendly. At the National Journal, she worked with counterparts at CBS News to train and supervise a multimedia team covering 2012 presidential campaign. Kiely covered Congress and national politics for USA TODAY, headed Washington bureaus for The Houston Post and The Arkansas Democrat-Gazette, was a White House correspondent for the New York Daily News and a general assignment reporter and Washington correspondent for The Pittsburgh Press. She holds a bachelor’s degree from Princeton University, a master’s degree from American University and was a Knight Fellow at Stanford University. A member of the Gridiron Club and numerous other professional organizations, Kiely served on the congressional Standing Committee of Correspondents and has been a longtime trustee of The Daily Princetonian, the college paper where she started her journalism career. As a graduate of Princeton and a native of Pittsburgh, Kiely is accustomed to rooting for Tigers and bleeding black and gold. The Lee Hills Chair in Free-Press Studies is one of 10 endowed chairs at the Missouri School of Journalism. The others and when they were established are: Goldenson Chair in Local Broadcasting (1982); Meredith Chair in Service Journalism (1986); Knight Chair in Digital Editing and Producing (1997); Maxine Wilson Gregory Chair in Journalism Research (1997); Houston Harte Chair in Journalism (1998); Curtis B. Hurley Chair in Public Affairs Reporting (1998); Missouri Chair in Community Newspaper Management (2000); Society of American Business Editors and Writers Endowed Missouri Chair in Business and Financial Journalism (2000); and the Donald W. Reynolds Endowed Chair in Business Journalism (2008). Knight Foundation has endowed more than two dozen chairs at leading universities to help educate the next generation of journalists, encourage classroom innovation, foster new technology and techniques, and contribute thought leadership to academia and the news industry alike.